This is a first outing in SOS for Polish speaker manufacturers APS, but they're already impressing us. I have to admit to never having tried Polish‑built APS (Audio Pro Solutions) monitors before, but as soon as I'd played a few tracks through them I could tell that they were a class act. The IO model that's reviewed here is priced similarly to comparable Mackies, and the smaller Dynaudio and ADAM monitors. They may appeal to those who prefer a more neutral, British sound, because my strong initial impression is that they tell it how it is. The APS IO monitor is an outwardly conventional active two‑way design in a ported cabinet, with an electronics pack that comprises the two power amplifiers and electronic crossover that are necessary to power the system. It is essentially a smaller version of the company's Aeon design. The electronics pack is fitted to the metal back-panel, which also has a finned heatsink to aid cooling. Both drivers are powered from TDA 7294 monolithic amplifier chips, which are rated at 70W each. Norwegian company SEAS build both the drivers used here. Unusually, the one‑inch tweeter is available either as a titanium‑ or a fabric‑dome version (we had the fabric‑dome version in for review). Both drivers are magnetically shielded for use close to CRT monitors. A seven‑inch, cellulose, paper‑coned driver looks after the bass/mid for both versions, and this is suspended in a soft rubber surround. MDF seems to be the main cabinet material, and the baffle edges are rounded to reduce cabinet‑edge diffraction, which might otherwise have a small detrimental effect on the stereo imaging. The dual ports are also flared to reduce wind noise, and exit via the baffle. Because the cabinet is small and has fairly thick walls, it is too rigid to have significant resonance problems. Both drivers are recessed into the baffle, and the woofer is secured using cap head wood‑screws that are driven directly into the MDF. Although this isn't as elegant as bolts and captive nuts, it doesn't seem to cause any problems. A satin black finish is applied to the entire cabinet. Optical limiters are used to protect both drivers, and the power amps are protected against RF interference, overheating, short circuit and over‑current. The crossover filters are set to 1.5kHz with a 24dB/octave slope. Power comes in on an IEC cable, with a switch next to the socket. The balanced XLR input also links to a balanced line output for passing the signal on to an active sub or other device. A balanced TRS jack input is also available courtesy of a Neutrik Combi socket that accepts either jack or XLR inputs, and there's a ground‑lift switch that may be useful in eliminating ground‑loop hum in problem systems. When the speakers are powered up, the APS logo on the front panel lights up blue: this flashes green when the input signal triggers the high-frequency limiter, and red if the bass amplifier limiter steps in to prevent driver damage. Although compact, at 330 x 210 x 300mm, these speakers are quite substantial for their size (13kg), and have an impressively wide frequency range, extending from 44Hz to 30kHz within ±2dB. They're capable of delivering peak levels of 112dB at one metre, or 104dB RMS, which is more than adequate for nearfield listening. The published signal‑to‑noise ratio is 103.5dB A‑weighted, or 101dB 20Hz to 20kHz, and listening tests show no significant background noise during operation. A closer look at the rear panel reveals a number of stepped rotary controls that can be used to tweak the frequency response of the system, to compensate for room acoustics and speaker placement. Input sensitivity is adjustable in eight steps from +30dBu to -10dBV, and the low end can be set in eight steps from ‑15dB to +6dB, which seems rather more range than is strictly necessary. APS have also fitted a 'bass controller' switch, but there's no clear explanation of what this does: the manual simply says that "The Bass Controller Switch allows you to switch off the Bass Controller, decreasing the low bass volume whilst increasing its speed." It seems, therefore, that the choice is between a bit less bass but a tight low end, and a bit more bass level at the expense of tightness. There's also separate adjustment of the tweeter level, again in eight steps, from ‑5dB to +3dB. My tests were done initially with the rear‑panel controls left set to flat, and the mysterious Bass Controller switch set to off. When comparing the APS IOs with the similarly sized Mackie and ADAM speakers that I normally use for reference, I didn't experience any great shock switching to the IOs, which I often do with some monitors that have a very 'different' sound. I was, however, immediately impressed by the firmly controlled bass from such small monitors and also by the detailed mids and high end, which has the kind of smoothness you'd expect from a high‑end British monitor, rather than the more 'forward' character that I tend to associate with US West Coast speakers. The low end isn't overblown, and I guess some bass freaks will think it a bit restrained, but at least it isn't tuned to accentuate only kick drums at the expense of everything else — and to me, it makes for a well‑balanced sound. I have to admit, though, that with the bass switch set to flat, I couldn't discern much difference with the Bass Control switches on or off. When I wanted to add more bass warmth, though, a 3dB bass boost combined with the Bass Control switched on did the trick without seeming excessive. The stereo imaging also demanded immediate attention: it came over as very wide and stable. Some monitors in this price bracket can tend to muddle the mid‑range slightly, but the APS IOs have a sound that can only described as being very much in focus, with excellent separation between instruments and a good sense of front‑to‑back perspective. I think the designers of the APS IO speakers have put their money in the right places, namely the drivers and crossover. The amplifiers are perfectly competent but affordable on‑chip devices, and the cabinet construction and speaker mounting is pretty basic, but again functional. Their tonal balance is about right for speakers of their size, with enough bass to do the job but not so much as to mask the mid‑range, and there's definitely no flab to the low end. I particularly like the smooth but detailed high end and clear mid‑range — they made good mixes sound good and bad ones sound bad, which is exactly what you want. 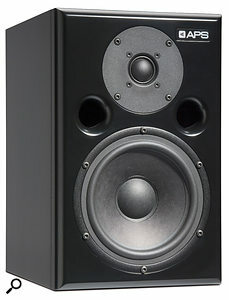 While you probably wouldn't use small monitors like this for mixing bass‑driven dance music, they work well in smaller rooms, and deliver an honest opinion of your mixes at a cost that may be above entry level, but is also way below exotic. All in all, I have to admit to being impressed by my first encounter with APS monitors. The alternatives really depend on your tonal preferences. 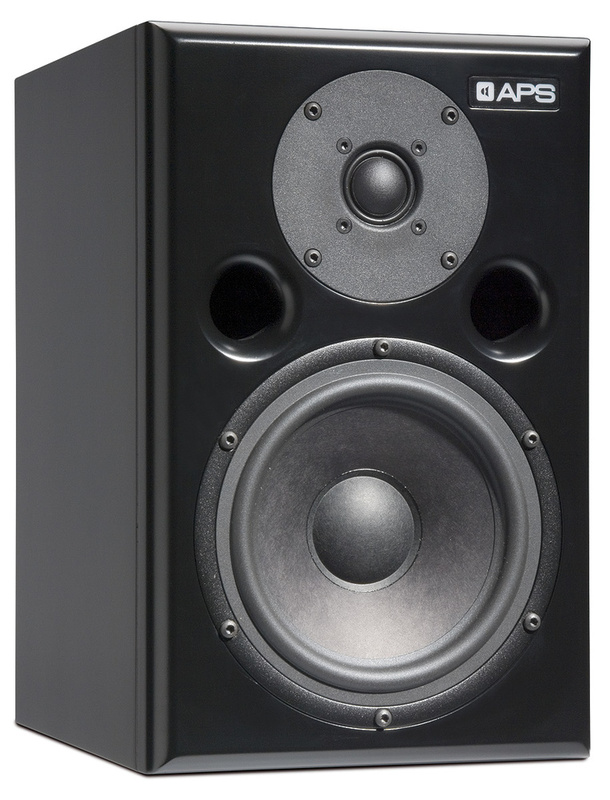 If you like the honest, smooth, 'British' sound, I'd look at AVI's powered speakers, the new Mackie HRM 624 Mk2s, or some of the smaller PMC models, but if you like a bit more air around the top end, the ADAM A7s do a great job, as do the smaller Dynaudio and Genelec models. Of course, you might also try the titanium-tweeter version of the IOs, although I've not yet heard them myself. Sensibly priced given the sound quality. Good tonal balance that delivers a detailed sound without harshness. Drivers are held in with screws rather than bolts, so these may work loose in time. The IOs are thoughtfully designed monitors, based on good components and established design principles. They deliver a detailed, smooth sound with a tightly controlled and slightly restrained low end with plenty of tonal balance adjustment on the rear panel. £1056.33 per pair including VAT. Funky Junk +44 (0)20 7281 4478. £1056.33 per pair plus shipping. Funky Junk +44 (0) 20 7281 4478.